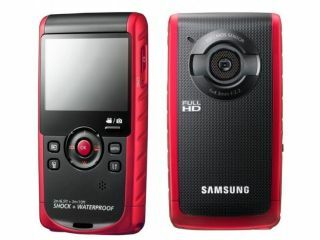 Samsung has revealed its latest pocket-friendly camcorder, the W200, which captures full HD video and can be used underwater. The W200 Pocket Cam is rocking a 5MP BSI CMOS sensor which should spell reduced noise on your flicks, and an F2.2 bright lens for superior low-light shoots. It shoots in full HD and you can your amateur masterpiece back on the 2.3-inch LCD screen which offers a multitude of viewing angles. It's the underwater shooting mode that makes the W200 perfect for you holidays though, reckons Samsung, as it comes with anti-fog glass, anti-water drop coating for the lens and an Aqua Mode setting. Like the popular but now sadly demised Flip camcorders, the W200 comes with a built-in USB arm. With microSD storage and autofocus as standard, the W200 hits the UK's shelves in May, but there's no word yet on pricing.